Revolutionary Girl Utena is one of the most inscrutable anime I’ve seen. It’s like half of me is struggling to keep up with what I’m seeing, while the other, at some base level, just instinctively feels it and understands. I suppose you could call this confusion. Or schizophrenia. Whatever. Episode 29 is my favourite of the series so far, and definitely the one that best represents what I love about it. Jury is on the brink of defeating Utena in their duel, all she need do is finish her opponent and be done with it, but she gives up instead; the sky grays, the rain falls and the match is over, but why? Why, having fought so hard, did she just give up? Utena is all about this kind of theatrical epiphany, a duel of adolescence where every emotional facade is shattered, emotive in the way that the landscape shifts with mood, attaching life-changing significance to every word spoken and movement made. It’s apocalyptic romance. For a while I tried to write an interpretation of Jury’s duel, but I’m not sure that’s what I want to do anymore. It’s like trying to put into words a beautiful painting, words just don’t capture it. 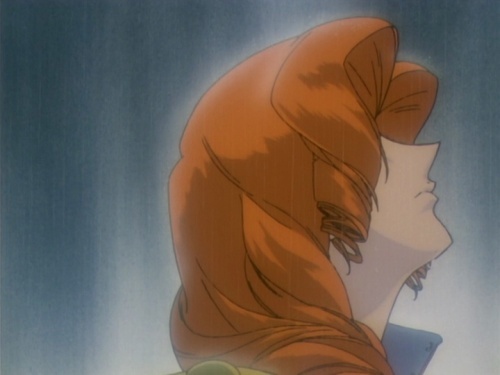 Utena remains as inscrutable as ever, but it feels special. You just have to see it. That’s the best I can do. The trick with Utena, in my opinion, is that you should never take it at face value. Well, not “never,” but overall I can’t help thinking of it as a long allegory. The series touches on so many levels, from obvious to subtle, from Jung and Hesse to homage _and_ deconstruction of the shoujo romance genre, that there’s something noteworthy about almost every moment. It helps that Utena is one of the very few anime (in fact, I can’t think of any other, though I’m sure there are some) where the “borrowed” and heavily used symbolism consistently makes sense in and outside of the show, without being forced or twisted to suit the creators’ ideas. About Juri’s duel, my interpretation is that she simply didn’t want to win after all. She knew that winning would’ve liberated her from her misery, but in the end she couldn’t throw it away, she preferred to stay prisoner of her love. Utena has some great parts (including an awesome ending) but I feel it was too long. It would have been better as a 26 episode series. But as far as female character who do not identify with common female traits I highly prefer Kino (Kino no Tabi) and Oscar (Rose of Versailles) to Utena. Utena is undoubtedly one of my favorite anime ever. It’s an absolute, unadulterated masterpiece. The first time I watched it, I came to the same conclusion as you: I couldn’t figure out how to describe it with just words. The thing with Utena is that it’s not the images; nor the music; nor the plot nor the dialogue that make the series special, but it’s the spaces in between all of those parts. That’s why the recap episodes work so well: just when you think you have a hold of an arc, or of a character’s story, the recap episodes interject something new. Since you’re only just finishing the first arc of the series, all I’ll say is this: just you wait. The coming arcs are equally rich and layered. Kunihiko Ikuhara is a brilliant, brilliant man. I can’t talk about this arc, because, well, I’ve forgotten it, or never watched it. Someone should release a complete series box! The thing is I’m not sure the creators planned to do this. I’m glad they achieved it. We need more shows that are so odd and fundamental that mess with the inner workings of our brains! Damn, we need a new release of this series! I don’t know about Eva (then again, I have my opinion on Eva…), but in Utena’s case the creators definitely planned it. It’s obvious that the director/writers/etc. paid much attention to everything, down to details and nuances; and as I said above, the symbolism, the archetypes, the homages, etc. are used carefully constructed and serve as an underlying theme. It’s no wonder, as both Ikuhara and Enokido are famous for being interested in gender, unique aesthetics and motifs, meta, psychology, etc. Btw, Enokido Youji is like a grey eminence behind Utena. Everybody praises Ikuhara, and for good reason, of course — but much of the visuals, the motifs, metaphors, weirdness, etc. which form an integral part of Utena comes from Enokido, let alone the fact that he wrote the screenplay for half of the show, including the most important episodes, like ep 29. Yet his influence is rarely ever acknowledged or even noticed, even by people who have seen his other works. I can’t understand how someone can’t recognize the similarities between Utena and, say, the Ouran Host Club anime. Apologies for taking (even) longer than usual to respond! I’ve been all messed up with (hopefully not swine) flu since Wednesday. Some parts I’m obviously missing, like the “homage _and_ deconstruction of the shoujo romance genre,” I haven’t seen Rose of Versailles or Oniisama e, but I’d love to have a go some time and I’m sure I’d get even more out of Utena with those series in mind. Oh, and since you mentioned Enokido Youji below, have you seen Melody of Oblivion? Quite possibly one of the weirdest anime ever made?! One thing I did notice is that although Utena is the main character, it’s not so much her story as it is the Student Council’s. It just has that iconic feel, ya know? Something very timeless about it, and immersive. Pretty much from the first episode, I knew I’d like it. I think Utena is very much a product of its time, too; something about that era of anime was just great, the character design, music, writing, it all feels so ambitious and emotional (another one from this era was Berserk, one of my favourites) but, and unlike most series being made today, wasn’t so hampered by the pressure to adhere to genre tropes or cliche or demographics. @ Bateszi, I think your comment about it being “a product of its time” is spot-on, but in an additional way. Utena looks a little old now, not so slick as it might have when it came out. And styles have changed since then. To me that adds to the Weirdness effect. To me, Utena looks a little like an artifact, like an old photo. Its apparent age gives it a resonance, because we can’t go back in time and really see how things were when it came out. I’m exaggerating a little. It was only the nineties, after all. But there’s still that look of … knowledge we’ve lost, to this show. I’ve explained myself badly here, but it’s hard to put into words. I had just finished watching this episode, and Jury is indeed quite interesting. For one she is the most powerful duelist so far, in that Utena never really defeated her. We can look at two things. The first duel, Jury questioned the existence of miracles, and miraculously lost. The duel was not in her own hands, so to speak. The second duel, she was being taunted by Ruka about miracles again — and her own stance on them this time is ambivalent, or at least not as certain. The duel in this case was very much in her hands, in that she chose its outcome. However, there are two miraculous things in this duel: 1) she did not fall victim to the prince ex machina powers of Utena; and 2) she actually refused to win, giving up her opportunity to bring the world to revolution (sort of unthinkable for a duelist). Jury’s duels can be read from the perspective of her core narrative of miracles. That’s what I think anyway. I am not entirely sure if I agree with this. In the end I think the Student Council Member’s issues end up being the same issue as Utena in some way faces herself. But I won’t say more since you are not finished. But I do agree that the student council members (for me at least) were more compelling characters than Utena in many ways. I am also sorry to hear you were not well and hope you are now feeling better.